The transportation market of Vietnam is witnessing significant changes since the rapid expansion of ride hailing apps Uber and Grab in recent years. Uber and Grab have made competition stiffer than ever, forcing traditional taxi firms suffering from a decline in market share to make technology-driven innovations. 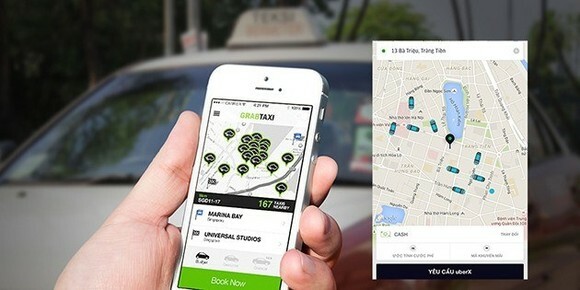 Seven taxi firms of Vietnam have developed their own car hailing applications, besides Uber and Grab, under a Government approved pilot project to apply science and technology in passenger transportation, which were now available on AppStore and Play Store. What’s significant is that car hailing apps of taxi firms do not increase fares during rush hours. According to Nguyen Van Thanh, president of the Auto Transport Association, the 4.0 industrial era is approaching and it is, therefore, vital to encourage transportation firms to apply advanced technologies. “As a matter of course, the competition will be fierce in both passenger and goods transportation,” Thanh said. Thanh added that supply exceeded demand, to some extent, raising a pressing question about appropriate management policies amidst a rapid increase in cars even as transport infrastructure was severely overloaded in large cities. Thanh cited statistics of the Vietnam Register, according to which the number of cars reached 200,000 in July. Recently, taxi firm Vinasun proposed that Grab and Uber should be managed as taxi firms in Vietnam. Viettel telecom recently signed a comprehensive strategic cooperation agreement with Vietnamese transportation startup Gonow. Accordingly, Viettel will provide Gonow with support in developing websites, sales network, customer care system and payment services. In addition, Viettel will hold 30 percent stake in Gonow. Founded one year ago, Gonow is a platform which connects drivers or car owners with customers to provide passenger and goods transportation services, as well as car leasing. Gonow currently operates in 64 provinces and cities nationwide and plans to expand to international markets from the end of 2018. At present, the platform has more than 170,000 members, a whopping rise from just 3,500 in the first quarter of this year.